Ajahn Viradhammo is the founder and abbot of Tisarana Buddhist Monastery in Perth, Ontario. He took bhikkhu (monastic) ordination in Thailand in 1974 at Wat Pah Pong with Ajahn Chah. He was one of the first residents at Wat Pah Nanachat, the international monastery in north-east Thailand. In 1977, he was asked by Ajahn Chah to join Ajahn Sumedho at the Hampstead Vihara in London. Later, he was involved in the establishment of both the Chithurst and Harnham monasteries in the UK. In 1985, he moved to New Zealand, where he lived for 10 years, setting up Bodhinyanarama monastery. In 1995 he went to the UK to assist Ajahn Sumedho at Amaravati and stayed for four years before returning to New Zealand, where he lived until 2002. He then returned to Ottawa where he cared for his mother for nine years. He is now resident full time at Tisarana. The Day of Mindfulness will include silent sitting and walking meditation, meditation instructions and formal teachings. If sitting on the floor, please bring your own meditation cushion. Chairs are provided. No Registration. Suggested Donation $20. All are welcome. Board a streetcar inside the station (please be aware of the new Proof-of-Payment requirements). Disembark at Willcocks Street, cross to the east side of Spadina Avenue, and walk south to #569. Street Parking on Russell Street, Huron Street, and Spadina Avenue. 3 hour limit, metered parking. All-day underground parking at 215 Huron Street (on the west side), between Russell Street and College Street West. $20/day. 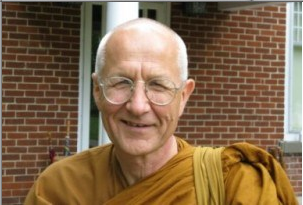 Ajahn Viradhammo will also be teaching at the Quaker House on May 13 &14, 2016 sponsored by Satipanna.